Space within manufacturing facilities vary greatly; therefore, it’s not a one size fits all when it comes to palletizing and cell layouts. When deciding on a cell configuration for your business, it is important to consider the reach of the robot, the necessary input and output space, the location, and the facility space available for the palletizing cell. The ‘reach’ of your robot is the spherical area surrounding the robot. This is the physical space that your robot can grab or release products within. It is a standard to measure from the center point of the robot out to the extended arm reach. This can be either physical length of the arm or the area it can stretch out in due to space constraints. This can also be reduced through programming to alter the required footprint of the equipment. 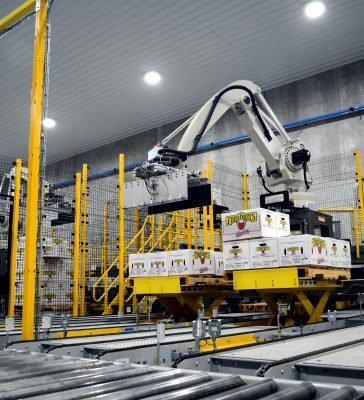 When robots have wide-reaches, the cell can have one or multiple lines feeding it to pick and place products, either onto multiple pallets or creating mixed pallets. Multiple conveyors require more space but often make robotic palletizing more economically justifiable. Common configurations are 1-in x 1-out, 2-in x 2-out, 3-in x 3-out, and 4-in x 4-out. Lastly, once the reach is understood and decisions have been made about the intention or desire to have single or multiple conveyors entering the cell, the space designated for the cell can be established. Understanding the entire production line and desired cell location will inform decisions about available facility space and possible configurations. Working with an organization that has created a variety of solutions for various applications, products, and facility sizes will be beneficial in helping you make the right decisions for your business’s needs. Columbia/Okura has extensive experience creating configurations for customers from 16 x 12 feet, stacking on the floor, to 30 x 30 feet, with 4-in x 4-out conveyors. Our team works with your products, people, and space to find optimal solutions for your business. To learn more about our cell configuration possibilities and robot sizes contact our sales department today.